This organ has some phenomenal sounds on it, especially the long sustained notes with attack on the start of the note. Some of its functions are similar in concept to the Hammond Novachord of the 1930s. There is something truly magical about having an instrument that is made up of over 40 valves glowing their little hearts out, feeling the warmth from the valve heaters (and that gorgeous old dusty smell! ), and even more amazing are the neon bulbs which light up different parts of the internal circuitry as you play! See a video here. 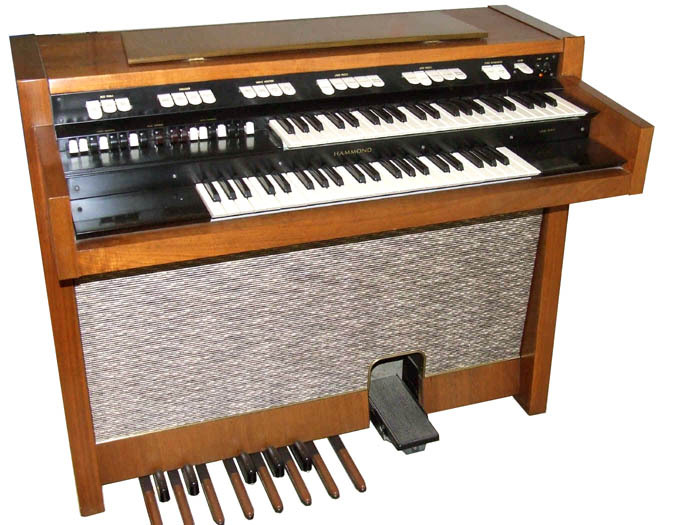 This type was famously used by Jazz players such as Alan Haven, and was also the organ used by The Beatles on Sgt Pepper, for the intro to 'Lucy In The Sky With Diamonds', the whirly chromatic organ runs on 'Being For The Benefit of Mr Kite' and various other tracks on later albums such as 'Something' on Abbey Road. The Beatles later purchased a transistor model, the Lowrey Holiday TLO-R1 (one of which we also have) for their Apple Studios in around 1969. Most of the leslie'd vocal effects on their Magical Mystery Tour EP were achieved by running it through the internal leslie of a Lowrey DSO. This particular example was purchased in 2015 and after being dusted and cleaned is 99% working! They are rare as hen's testicles! Sound clips of its various functions below. LOWREY HOLIDAY TLO-R1 (circa 1969) TRANSISTOR VERSION OF THE DSO-1, WITH MANUALLY PLAYABLE DRUM SOUNDS, BUILT IN LESLIE AND WAH WAH PEDAL! A classic instrument with valve amps and Hammond's hallmark tonewheel generator with all original red mylar capacitors. Thankfully, still nice and crisp sounding! As with all our old equipment, this one has needed a lot of maintenance over the years, but it has been well looked after and played for hundreds if not thousands of hours in its liftetime! Allegedly once the property of Apple Studio, Savile Row... sadly no conclusive proof it did, aside from one long brown hair, and one long black hair found wrapped around one of the pedals, which obviously came from the heads of John & Yoko! This instrument also has a stereo line out from the main AO29 main valve amp and the AO44 reverb valve amp for a clean, key and pedal click-free sound! Note the percussion sounds, and various vibrato and celeste sounds. Also it has a lovely internal spring reverb. BIRD ORGAN, MK II (1963, Sydney Bird and Co, UK - All valve with matching stool and Amp) this one originally used by Don Shinn on The Soul Agents' singles on Pye in 1964/5. GEM JUMBO 61 (Italy, c.1970) - Broken speaker giving a marvellous 'Magic Roundabout' type sound, with stupendous bass sounds and scary fast to stupidly slow vibrato! This has got to have the loudest on-board solid state amp ever designed! The sound clip is the organ 'au naturale' - blower noise is inherent in the recording to a certain extent, but is part of a proper small pipe organ's overall sound. Recorded here in mono with one vintage AKG D19b microphone. Flat EQ and no limiting/compression. The first piece is the organ tuned up to concert pitch, and the second is the organ detuned a little, to give it a circus calliope type sound. Steve is playing this piece, which he was commissioned to write many years ago for a short play entitled 'Dr Horror'! This organ is basically The Specials and Jerry Dammers "organified" - It has all of the great sounds you can hear on their album 'More Specials' as well as the famous organ/synth clarinet sound they used on 'Ghost Town.' On the face of it, it's quite a cheesy instrument, but it's got some lovely warm string sounds, great organ percussive timbres and lovely late 70s/early 80s stabby sounds. Built-in leslie (with speed control!) and beat box with arpegiator which is actually quite interesting, depending on how you play it. It's also got some very CS80-esque timbres, especially the piano sound. Various other pianos, Harpsichords etc. ...and don't forget, any recording we do using MIDI controlled instruments will be sent along with the MIDIFILE we create (no extra charge), so you can change the sounds to your heart's content!